The 2018 Class 1A state champion Port St. Joe Sharks. For the rest of time the 2018 Port St. Joe Sharks will be immortalized at the school, a team that came together with a special bond and carried that all the way to a state championship. Monday afternoon the Sharks culminated their impressive playoff run by dogpiling together on the field at Hammond Stadium in Fort Myers, after earning a 4-0 win over the Madison County Cowboys to earn the Class 1A state championship. When Ashley Summerlin first took over as manager at the start of the season, it seemed very unlikely things would end in the program celebrating its second state title together. The Sharks (18-12) last won it all back in 1997, long before any of the current players were ever even born. Taking down the Cowboys in their second straight 1A title game was no simply task. Madison County was also led by a first-year manager, after former JV Head Coach Jason Fletcher took over the coaching reigns from longtime manager Terry Barrs, who retired at the end of last season. After reaching the Final Four for the first time last year, the Cowboys raised the bar in scheduling tougher competition and doing everything they could to prepare to perform at the state tournament. Jaebion Mitchell rounds second after blasting a triple in the top of the seventh inning for Madison County. The Sharks drew first blood to take a 1-0 lead in the bottom of the second. Bryce Register connected for their first base hit of the day with a grounder to right field, and Jaden Grantland moved him into scoring position with a liner into left field. John Gee then delivered an RBI grounder up the middle that plated Register ahead of the relay throw from center. Port St. Joe opened that lead with a big hit in the bottom of the third. Josh Butts and Caleb Butts both walked, and Register put a solid swing on a 1-0 offering and lined the ball deep into the right field corner to drive in both base runners, before Register was caught on the bases trying to stretch the hit into a triple. The Cowboys looked to respond in the fourth, before the Sharks’ defense came up big to hold the rope. Madison County second baseman Drew Annett walked and then moved to second on an error to get into scoring position with two outs. Logan Lepper then connected on a roller to the right side, where Port St. Joe second baseman Jaden Grantland made a nice sliding grab to get a glove on it. He then made a perfect throw to record the out and preserve the shutout, keeping all the momentum on his side of the field. The Sharks then went back to work in the bottom half of the fourth. Grantland walked and Gee lined a single past the first baseman for a pair of ducks on the pond. Cameron Harmon then connected with the lead runner in motion for a perfectly-timed hit-and-run that plated Grantland to make it a 4-0 advantage. The offensive support fueled starter Chris Stockton, who went the distance on the mound for the complete-game shutout. The senior scattered four hits and two walks, with one strikeout. 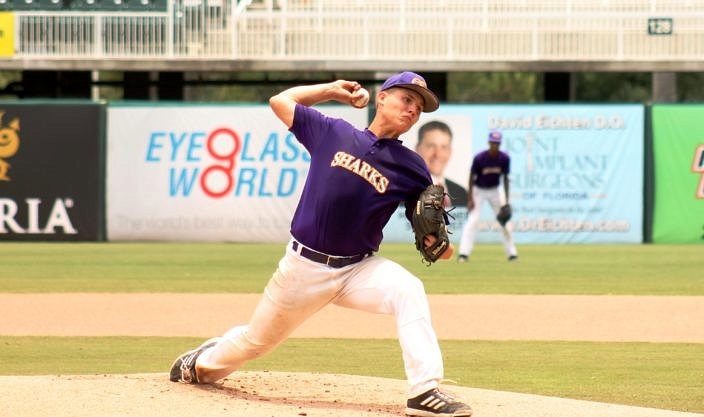 Sharks starter Chris Stockton went the distance for the complete-game shutout. Some big defensive stops helped keep the Cowboys (16-12) in it after the Sharks put two more runners in scoring position in the bottom of the fifth. Josh Butts walked and Caleb Butts followed by scorching a double past the diving third baseman. 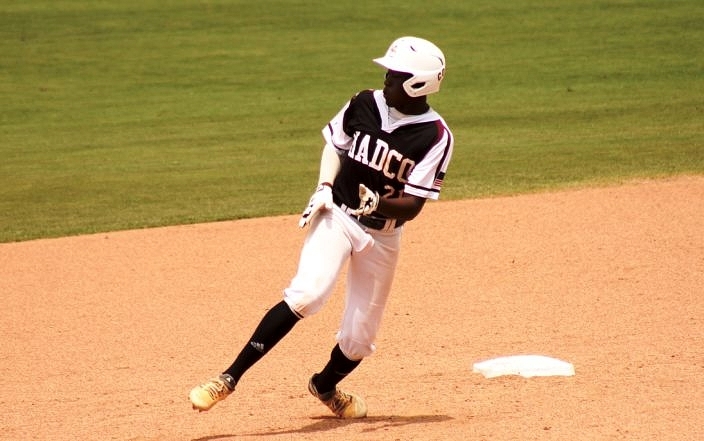 Madison County first baseman Jaebion Mitchell then made a nice play by snagging a grounder up the first base line and charging up to tag the runner, while also holding the runners on their bases. A fly ball to center was then hauled in by Charlie Blanton to quell the threat. The Cowboys had rallied back to victory several times during their playoff run, and played several extra-inning games during the year. Those experiences gave them confidence to the very end to always keep hope alive. Even down to their final swings, Mitchell epitomized that heart when he crushed a shot deep to center and raced around the bases for a triple. Needing just those final crucial outs to finish things off, the Sharks dug in and did exactly that. Register leaped up and snared a screamer to left for the second out, and Gee hauled in a pop fly for the final out that clinched the win and sparked the championship celebration. Even with their own title hopes dashed short again, the Cowboys left the field on Monday knowing all they did accomplish. Having reached the Final Four each of the past two years after having never been there prior to that, this group helped raise the bar and set a high standard for the future teams to come. 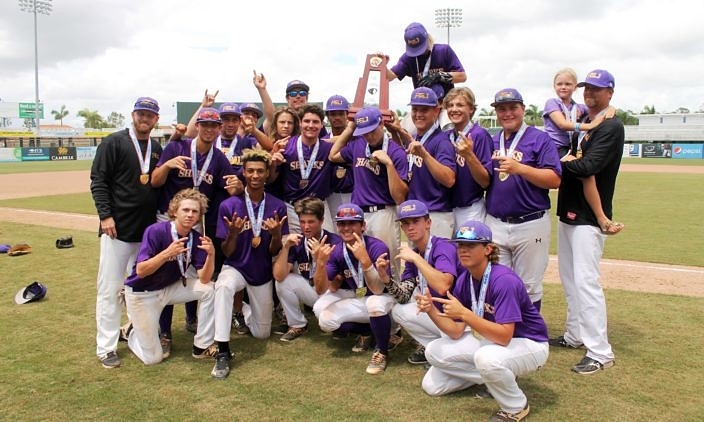 Madison County has played in four close, competitive and exciting ball games at the state tournament to let the rest of Florida see for itself the passionate and quality baseball that they play. The Cowboys catch out a potential base-stealer.